From 10:45 PM Friday, January 20 to 5:00 AM Tuesday, January 23, there will be no 2 or 3 train service (meaning no service at Clark Street or on the 2/3 platforms at Borough Hall), which will be a fact of life every weekend until sometime this summer. As usual, during the absence of 2/3 service, 4 and 5 (5 trains don’t usually serve Brooklyn on weekends) will provide alternate service to and into Brooklyn. Each night, Friday to Monday, from 9:45 PM to 5:00 AM, there will be no R service in either direction at Court Street or at the R/N platforms at Jay Street-MetroTech. Service from Manhattan and into Brooklyn from these stations will be provided by N trains, and service from Brooklyn and into Manhattan by Q trains. The following week, Monday, January 22 to Friday, January 26, the following late night changes will be in effect. From 9:30 PM until 5:00 AM there will be no service in either direction at High Street, as A trains are diverted to the D line between 59th Street-Columbus Circle and the F between 34th Street-Herald Square and Jay Street-MetroTech and C train service ends early. Those traveling to or from the North Heights may use York Street in DUMBO (A and F service) or the 2 to or from Clark Street. There will be no 3 trains each night 9:45 PM to 5:00 AM; 2 and 4 trains will provide alternative service, with 2 and 4 trains making 3 train stops for those traveling to or from Brooklyn. 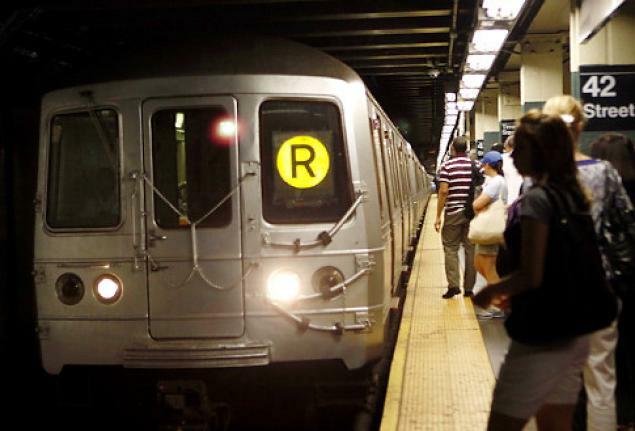 R train service will be suspended each night from 9:45 PM to 5:00 AM; use N trains instead.